We have been talking about ways to access all your different e-mail accounts at once with a single login and in a single window. Now you can access all your Gmail Accounts simultaneously from one single Gmail Account (or Master Gmail Account) using Gmail’s new “Grant Access To Your Account” feature. If you want to access and read mails from e-mail accounts with different service providers you may like to read our previous post on this issue. Multiple logins in Gmail was already speculated and now Google has provided this feature in a unique way. 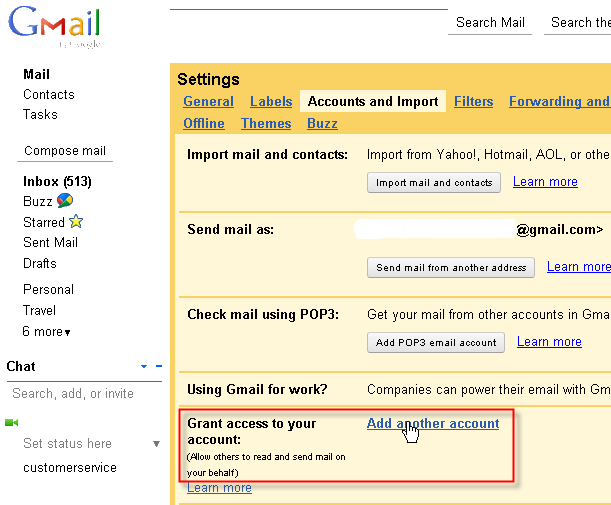 Google has introduced a new feature called “Grant Access To Your Account” in Gmail. You can use it to login to all your Gmail mail accounts simultaneously. Below I have explained the process as a pictorial walk-through. In Settings click on “Accounts and Imports“. In “Grant Access To Your Account” click on “Add another account“. A pop-up window appears.Fill in the address of your Master Gmail Account here. Remember that your Master Gmail account gets access to your Slave Gmail account and not the other way round. Once you allow sending email to the master account, an information window appears and tells you that email has been sent for confirming the access request. Now log into your Master Gmail Account and click on the small triangle next to your mail address.Your “Slave Account” appears.Clicking in this account will open a new window with mails from the Slave account without asking password of the Slave Account. 1. You can add as many Gmail Accounts as you like. 2. Master account holder may be different from Slave account holder.So you can provide access to your Gmail account to your spouse for example without compromising on your control over your Gmail account. 2. Master Gmail account user can not change password or settings of Slave Gmail accounts. He can only read, write and send mails from Slave gmail accounts. 3. Slave Gmail account can revoke access any time by deleting the access to Master Gmail Account as shown below. 4. One Slave Gmail Account can grant access to more than one Master Gmail accounts. Gmail users are in luck here.Other leading email services like Yahoo, Rediff and Hotmails must be listening! !